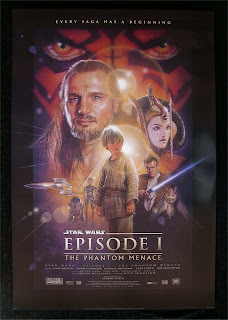 It was ten years ago today that Star Wars Episode I: The Phantom Menace opened, the first Star Wars movie since 1983. I saw it twice on opening day... and both times before 6 a.m.! The week before its release date I camped out overnight at the West End Cinema in Burlington, North Carolina (following a great evening of InterVarsity Christian Fellowship at Elon) so that I could get tickets the next day for me and a bunch my friends at the midnight premiere. And then a few days later The Good Morning Show on WFMY was asking some Star Wars trivia questions and asking people to call in with the answers. I didn't even know it was a contest at the time. The question was "What Star Wars planet has mile-high skyscrapers?" and bleary-eyed that I was just waking up, I knew it was Coruscant. So I phoned in and turned out I had just won two tickets for a 3:10 a.m. showing on opening day. Long story short: about thirty of us saw the first showing of Star Wars Episode I at 12:01 a.m., and then I hightailed it to Elon, picked up good friend Clark and we sped off to Greensboro for his first time watching the movie, my second. A reporter from WFMY was there and he asked if we could stick around to be interviewed live for The Good Morning Show, so we did that for two segments and then headed back home. Looking back on it, I've mixed feelings for The Phantom Menace. No doubt a lot of us now think that the movie could have been better. That our enthusiasm for it stemmed primarily from the fact that we had been starved of a new Star Wars movie for so long. But I also think that whatever shortcomings Star Wars Episode I had, were more than made up for by the subsequent two prequels. As its own film, it's not half bad, but not really half good either. Taken as the initial chapter of the Skywalker family saga that arcs throughout all six Star Wars movies however, it works pretty well.